In a record setting deal ($17.5 million), Fox Searchlight has acquired the rights to the controversially-titled* slave rebellion biopic The Birth of a Nation. (*The Birth of a Nation was also the title of the 1915 D.W. Griffith film about the founding of the Ku Klux Klan). 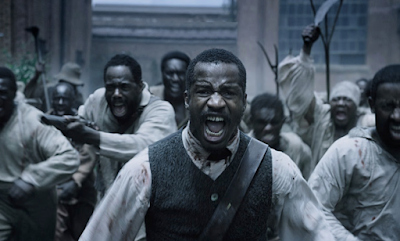 Nate Parker produced, directed, wrote, and stars in The Birth of a Nation as Nat Turner, the slave who led a rebellion in Virginia in 1831. Even though Fox Searchlight set a record with their $17.5 million winning bid, they actually were not the highest bidders, as both Netflix and producer Byron Allen reportedly submitted larger bids of $20 million each. When the revolt does come – a rebellion that saw five dozen slave owners and their families killed – Parker doesn’t leave anything to the imagination. Heads are crushed, stoved in and chopped off. Bodies are burned, teeth are broken. It’s a cathartic blood-letting that recalls the huff and puff of Braveheart, but instead of Mel Gibson splattering the English, it’s Parker hacking at the slave owners. Times haven't changed much, have they?